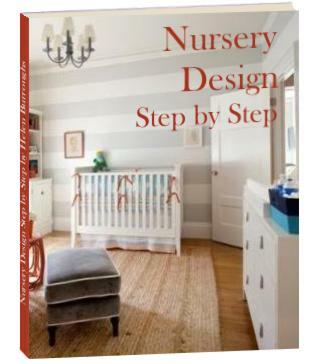 Your Best Source of Shabby Chic Nursery Design Inspiration! 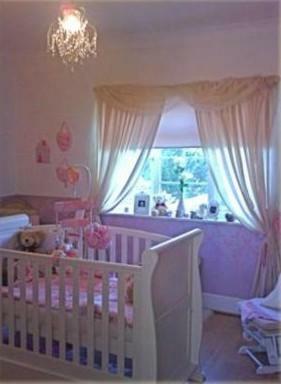 Lots of Nursery Photos Submitted By Our Readers and a Few Celebrity Baby Rooms! Are you looking for shabby chic nursery decorating inspiration? Are you thinking of using vintage decor in your baby room and you need nursery design ideas? Then you've come to the right place! On this page you'll find lots of shabby chic nursery pictures to help you with your nursery decorating. 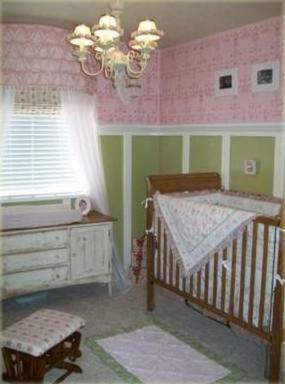 This shabby chic baby nursery was sent to us by Shealy McKinnon. This floral nursery was sent to us by Holly Yager from Monroe, Michigan, USA. 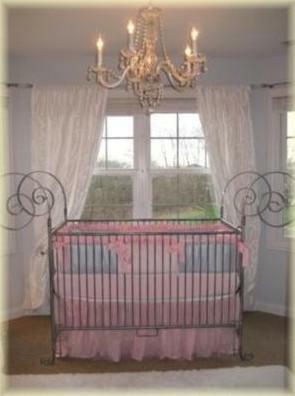 This shabby chic baby nursery was sent to us by Tiffany Hausdorf Largo, Florida, USA. 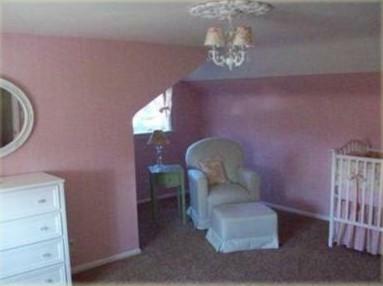 This ballet inspired pink and green baby room was sent to us by Trisha Baker from Clayton, UT, USA. This elegant baby nursery design was sent to us by Kimberley Mills from London, UK. This shabby mod chic nursery idea was sent to us by Nick from Tampa, Florida, USA. This cottage chic nursery decorating idea was sent to us by Debbie Kornusky from Marinette, WI, USA. 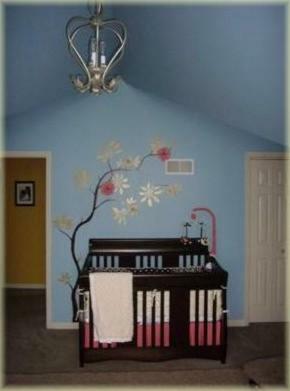 This baby nursery with stencilled walls was sent to us by Allison from Cortland, IL, USA. This beautiful powder blue shabby chic nursery with flowers was sent to us by Jolene from PA, USA. This designer baby room design was sent to us by Jennifer Grutzius (Chicago IL USA). 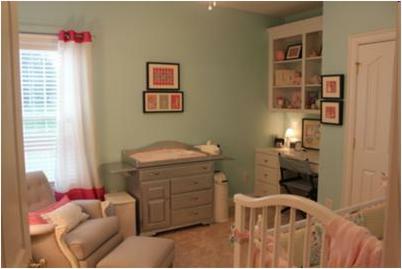 This whimsical chic baby room was sent to us by Jennifer Palmer (Calhoun, Ga). 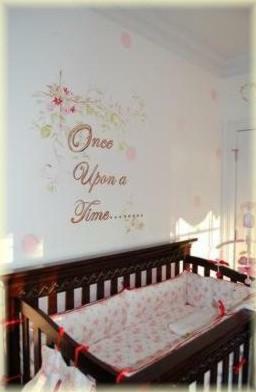 This princess inspired shabby chic baby nursery was sent to us by Brooke Towe (Chattanooga, TN). 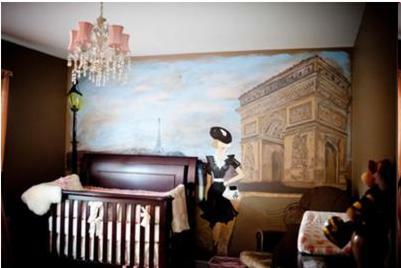 This unusual chic nursery inspired by Paris was sent to us by Kelly Lyn Drum (Houston, Texas). 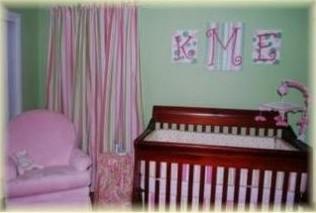 This beautiful blue and pink shabby chic nursery was sent to us by Gwynne (Gastonia, NC). 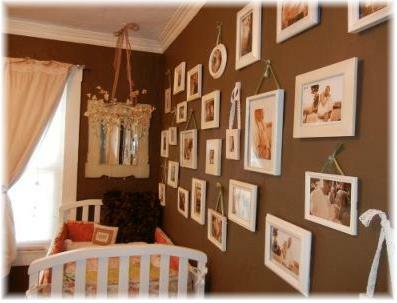 This photo wall inspired shabby chic baby room was sent to us by Amber (CA). 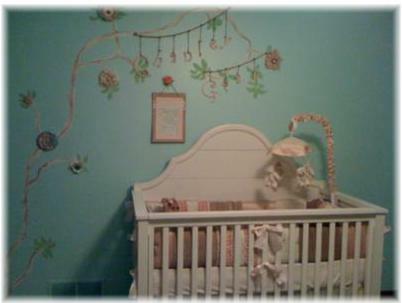 This shabby chic baby nursery with trees and flowers was sent to us by Chelsea Young (St. Charles, IL). 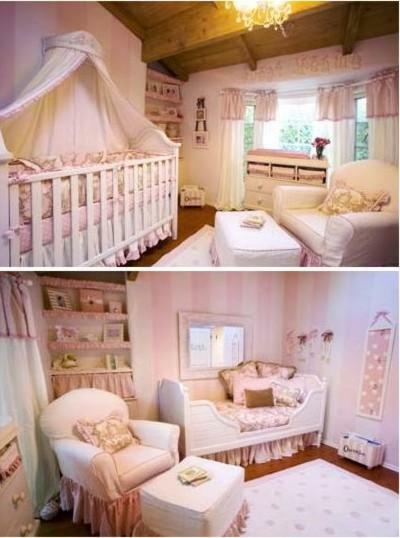 This princess inspired baby nursery in chocolate and pink was sent to us by Hannah May (Marquette, MI, USA). This damask inspired baby nursery in pink and grey was sent to us by Joselyn (California). 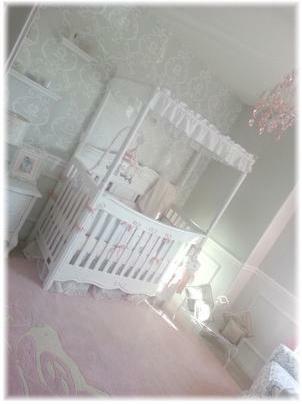 Another beautiful damask baby nursery sent to us by Ashton Marchand (Beaumont, TX). 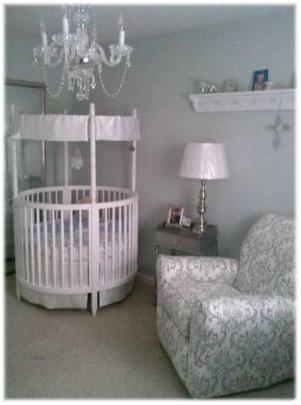 The round crib is the featured element in this baby room sent to us by Natasha(Garden City, MI). The back wall in this pink and grey nursery room is upholstered in grey linen giving it a really unique look. It was sent to us by Krisalyn Gleaton (Charlotte, NC). 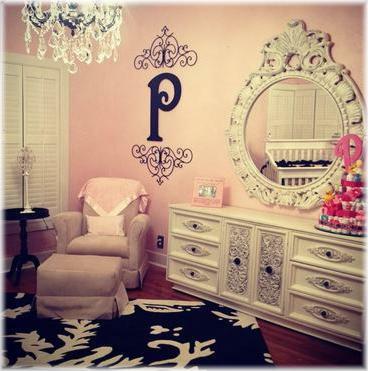 Let's start with the shabby chic nursery actress and model Brooke Burke had designed for her daughter Rain. She decorated with soft toile, polka dot and linen fabrics in pink and chocolate shades and added gorgeous shabby chic frames, ruffles, memo boards and other details to round off her nursery design. I have to say that, unlike many of the celebrity baby nurseries out there, I love it! Actress Jennie Garth had an adorable toile shabby chic nursery designed for her daughter. 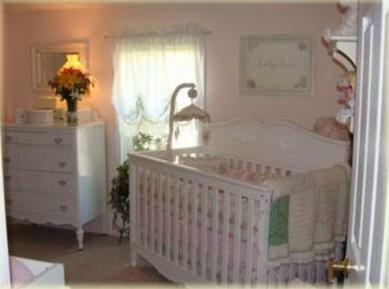 She used shades of light pink and brown with a beautiful white Jenny Lind crib. 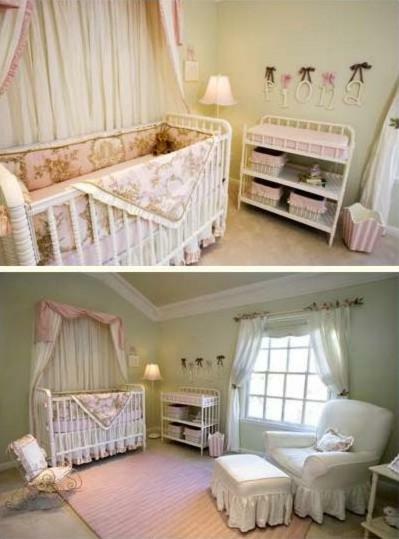 I love the crib canopy in this baby room which is another one of my favorites! I hope these shabby chic nursery photos gave you some ideas and inspiration for your own nursery design. Find a way to celebrate the old with the new with your own shabby chic nursery.